Manhattan Orthopedic Care’s shoulder specialist Dr. Armin Tehrany has performed thousands of shoulder surgeries. For each and everyone, he has to be sure that the patient knows the details of the shoulder surgery and the rehabilitation that follows. 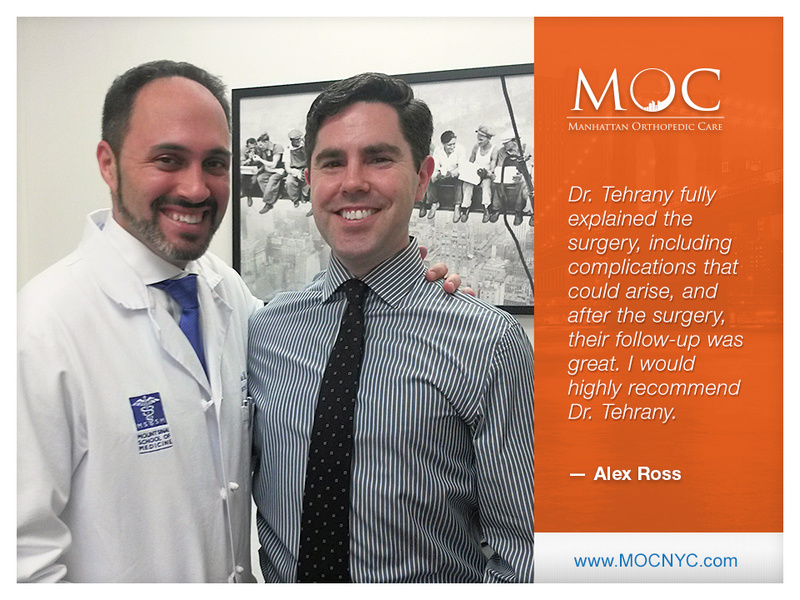 As with Alex Ross, who visited MOC for a triple labrum shoulder surgery on his left shoulder, Dr. Tehrany made sure that Mr. Ross knew about the procedure, and was very comfortable with it. Dr. Tehrany is an experienced professional who can perform the most complex shoulder surgeries, but that’s just one part of the whole picture. The other part involves the patient, who must be informed and knowledgeable about the complications that may occur, and about the recovery to full health. “Dr. Tehrany and his staff are great. Not only are they kind and compassionate, they are thorough and detail oriented. They performed a triple labrum on my left shoulder about six months ago. Before the surgery, Dr. Tehrany fully explained the surgery, including complications that could arise, and after the surgery, their follow-up was great. I would highly recommend Dr. Tehrany”, said Alex Ross in his patient testimonial. Thank you, Mr. Ross, for your kind words!